Today Match Prediction of Karnataka vs Mumbai, Round 3, Elite Group A Preview, Playing 11, Injury Updates, News and Dream11 Prediction. KAR and MUM will be looking to register their first win in this season. If you are looking for KAR vs MUM Dream11 Prediction then you are are the right place. Karnataka is all set to take on Mumbai from Tuesday, November 20, 2018 – Friday, November 23, 2018, at KSCA Stadium, Belagavi. Do you want to know Who Will Win? Then you are in the right place. In Today’s Dream11 Fantasy Cricket Match of KAR vs MUM, we will cover Pitch Report of KSCA Stadium, Belagavi, Predicted Playing 11, Toss Prediction, and Fantasy Cricket News and Tips. You May Like to Read VID vs BRD Dream11 Prediction. Who Will Win the Match Between VID vs MAH and Toss Prediction? Where Can You Watch the Live Streaming of KAR vs MUM Round 3, Elite Group A or Channels to Watch? Karnataka and Mumbai, both the teams have started their campaign with a draw and will start their next round with a positive intention to win the match. Last year they met each other in the Quarter-Final and KAR have defeated MUM with an innings and 20 runs. Mumbai had a good time with the bat and bowl in the first match but they failed to win the match they had to satisfy with a draw. Shivam Dubey, Siddhesh Lad, Suryakumar Yadav and Aditya Tare have contributed with the bat. Tushar Deshpande was only the bowler who had a good time with the ball. He took 6 wickets. On the other hand, Karnataka also had to adjust with a draw. Big names like Karun Nair failed to leave an impression on the opposition. Dega Nischal and Sharath BR are the only players who scored 100+ runs. Jagadeesha Suchith had bowled an outstanding spell and took 9 wickets. Abhimanyu Mithun and Prasidh Krishna took three wickets each. Many key players will not play today’s match as either they are with India Team or India A Team. Read the complete lineup and team news and players injury updates below. Dega Nischal, Sharath BR, Vinay Kumar, Shreyas Gopal, Jagadeesha Suchith, Abhimanyu Mithun and Prasidh Krishna are the key players of Karnataka Team. Vinay Kumar will lead the KAR Team. Karun Nair and Ravikumar Samarth will not play the match as they are with India A team. Pavan Deshpande, Liyan Khan, Mir Kaunain Abbas or Ronit More may replace the former players. Dega Nischal, Krishnamurthy Siddharth and Sharath BR will lead the batting department. Jagadeesha Suchith, Abhimanyu Mithun and Prasidh Krishna will lead the bowling department. Jagadeesha Suchith and Dega Nischal are the most valuable players. Batsmen: Dega Nischal, Krishnamurthy Siddharth, Pavan Deshpande, Mir Kaunain Abbas/ Liyan Khan. Bowlers: Abhimanyu Mithun, Vinay Kumar, Prasidh Krishna. Sharath BR (wk), Mir Kaunain Abbas, Vinay Kumar (c), Pavan Deshpande, Krishnamurthy Siddharth, Ravikumar Samarth, Shreyas Gopal, Dega Nischal, Liyan Khan, Karun Nair, Abhimanyu Mithun, Stuart Binny, Shishir Bhavane, Jagadeesha Suchith, Ronit More, Prasidh Krishna, Srinivas Sharath. Shivam Dubey, Siddhesh Lad, Aditya Tare, Suryakumar Yadav, Tushar Deshpande and Dhawal Kulkarni are the key players of Mumbai Team. Dhawal Kulkarni will lead the MUM Team. Shivam Dubey, Siddhesh Lad and Suryakumar Yadav will lead the batting department. Tushar Deshpande, Dhawal Kulkarni and Shams Mulani will lead the bowling department. Mumbai may play with the same playing 11. Batsmen: Suryakumar Yadav, Siddhesh Lad, Akhil Herwadkar, Jay Gokul Bista, Ashay Sardesai. Bowlers: Tushar Deshpande, Dhawal Kulkarni, Shams Mulani, Karsh Kothari/Akash Parkar. Dhawal Kulkarni (c), Aditya Tare (wk), Karsh Kothari, Jay Gokul Bista, Akash Parkar, Akhil Herwadkar, Siddhesh Lad, Ashay Sardesai, Tushar Deshpande, Suryakumar Yadav, Eknath Kerkar, Shivam Dubey, Royston Dias, Shams Mulani. If we look at the last five matches, KNTKA has won three matches out of five whereas MUM has failed to win a single game. Two matches were drawn. According to crix11 astrology prediction, the outcome of the match will be a draw. MUM will win the toss and ask KAR to bowl first. 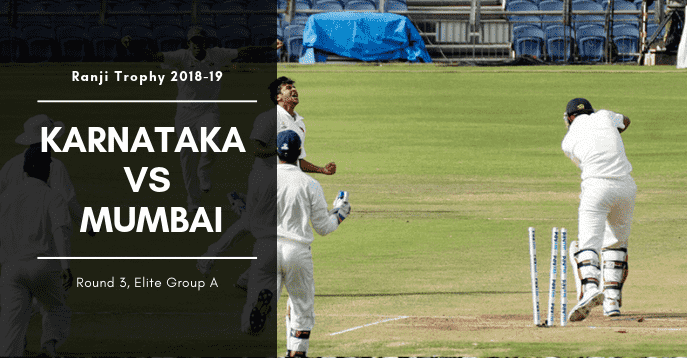 Match Ranji Trophy 2018-19, Karnataka vs Mumbai, Round 3, Elite Group A. The pitch of Belagavi, KSCA Stadium is expected to be a batting friendly. High score is predicted today. The bowlers can also take advantage of the wicket if they bowl in the right area with the proper line and length. Overall the wicket will favour the batsmen. Fantasy Cricket Tips: Try to take quality batsmen in your Dream11, Myteam11 or other fantasy cricket leagues. It is predicted to be mostly cloudy on the first day and mostly sunny on the second day. It will be partly cloudy on the third and fourth day. The temperature is expected to be 31-Degree Celsius and the humidity to be 52% which may go up to 68%. Fantasy Cricket Expert Tips of Today Match Prediction: The weather condition will favour the batsmen and the seamer. The fast bowlers will get benefit in the initial couple of overs. Star Sports has all the exclusive rights to broadcast Ranji Trophy 2018-2019. Only a couple of matches will be broadcasted live on Starsports. You can also watch the match live on Hotstar Digital Platform (App and Website). You can get the complete ball by ball live commentary of KAR vs MUM (Karnataka vs Mumbai), Round 3, Elite Group A – Live Cricket Score, Commentary here. This is it for Today’s KAR vs MUM Dream11 Team Prediction of Round 3, Elite Group A. If you want to increase your chance by 100% then read the post carefully as on every section you will find some important information which will help to make a perfect team in dream 11.